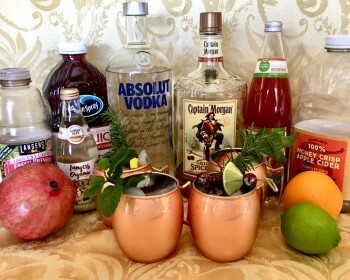 While looking for a holiday cocktail that was festive, yet different, for entertaining this season, I decided to try variations of the classic cocktail, the Moscow Mule. 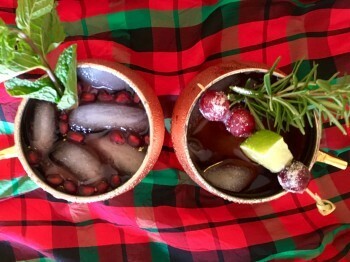 Made with vodka, ginger beer, and lime, and served in a copper mug, this classic cocktail was the perfect drink to refashion with holiday flavors – cranberry, pomegranate, orange, and apple. The Moscow Mule cocktail was created in the early 1940s, when vodka became popular in the United States. Although there are east coast and west coast seminal versions, most accounts credit a bar owner with an over abundance of his ginger beer product and two vodka representatives devising the drink and having it served in a copper mug. The copper mug makes a beautiful presentation, it photographs well, and it keeps the cocktail cold. However, it is now recommended that the copper mugs be lined with food-safe material. Amazon.com has a large selection of this beautiful barware. The following cocktail recipes make one drink, but if you are entertaining a group, you may want to make a large batch. Multiply the ingredient amounts by the number of guests. Combine all the ingredients except the ginger beer into a large pitcher and keep chilled. This can be made ahead of time for convenience. 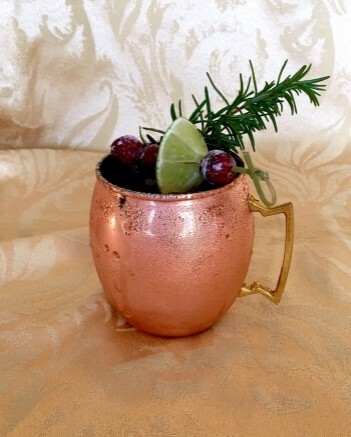 As your guests arrive, fill copper mugs with ice, and then pour enough of the cocktail mixture to fill mugs about half full. Top with ginger beer. Pour vodka, cranberry juice, and lime juice into a copper mug filled with ice. Top with ginger beer; stir gently. Garnish: Thread fresh cranberries on a cocktail pick and dip in lime or orange juice; sprinkle with sugar. Place on top of drink; add rosemary sprig. Fill copper mug with ice. Add vodka and juices. Top with ginger beer and gently stir. Garnish with pomegranate arils and a sprig of mint. Pour vodka and juices into a copper mug filled with ice. Top with Italian Blood Orange Soda; stir gently. Garnish with orange slices and rosemary sprig. The following mule variation embraces the spices of the season and replaces the vodka with rum. Add ice to copper mug. Pour in rum, apple cider, and lime juice. Top with ginger beer or sparkling apple juice; gently stir to combine. Garnish with apple slice and cinnamon stick.